Here on Edge in deepest Sussex, everything is announcing the fact of the Spring's arrival and suddenly the apple tree is again covered with a dusting of green. The long, long winter means that many things will grow very well after all that deep, nourishing sleep. My Good Friday buns neighbour is out every day with her grandchildren, gardening, her favourite thing to do. My other neighbour is re-building his extension. In the village there are two new cafe places, one macrobiotic and the other full of artisan breads, deli whatnots and outrageously handsome cakes. I wonder how much longer I can describe myself as living on edge when every time I look another bijou place has opened and what with antique shops, estate agents, upmarket eateries, not to mention a film society that has won all the awards, never mind that it is still on slightly uncomfortable chairs in the village hall (but that is part of its charm, and you can get wine and organic chocolate to have while you watch). You get the picture. The scruffy cottages that make up part of the delightful and crater-ridden bit of unadopted road where I live are where the not-so-well-off and living-on-a-shoestring people are. We no longer fall into the latter category but don't have enough money to get the house re-wired, new boiler etc. Well how could we with second home and Lamborghini to maintain? Only joking about the Lamborghini, but you know. Can I still really claim to be a margin-dwelling hippy punkster in the middle of all this? Yes I bloody well can, courtesy of an exclusive (actually fairly inclusive) and fascinating-to-nobody-but-the-Afflicted- Elect neurological disease. I am still on Edge and the solitary forest walks that I can't wait to take up again, soon please, have a particular meaning for me. And further: were I to be, for some reason that no-one can possibly imagine, made suddenly well and whole and cast into obscenely rude health, for which believe me I still pray daily (because I do not, will never accept the situation, in spite of all the clear evidence stacked against me, sorry Gawd, and especially sorry Buddha) then I will keep a goodly portion of my Edge-acquired introverty habits. Nothing very much will change. I will just be able to work - and swim, and walk where and when I please, and everything will be illuminated. I will be giving a reading in London on Saturday at the Second Light Spring Festival, courtesy of my prize-winning poem, and I have to decide which poems to bring. Feeling strangely nervous about it. Not as though I haven't done readings before, but never in the Smoke. There will be some terrific poets there. Afterwards I will stay with my good London writerfriend and we will talk, as we always do, about The Writing. Next day being Mothering Sunday, I will go to Daughter's flat for breakfast, and from thence back to the Edge, with Son. All good things and, as always, I rely on the angels to get me through. Lovely Montag has told me that the person I referred to as Renaissance Dame is actually Sibil of Delphi, "seriously appalled by what the news of the Future is, and she realizes it just might be too late." Ach! Or, as my dear old grandma, might have said: dass fehlt uns noch! So I won't put her up again. You were getting sick of the sight of her anyway, weren't you, be honest. And you don't really want to hear any more of the Mozart's Mass either, do you? I can just tell. Well never mind, I am putting up the Mozart's Ave Verum (we are singing that too), with the score, so you can sing it - as I will be doing, tonight. But now I go to make cabbage and potato soup. It's what you do when Abel and Cole keep giving you Savoy cabbages, and we do have to eat. There is always that. a living being flinging its changes at a still universe. 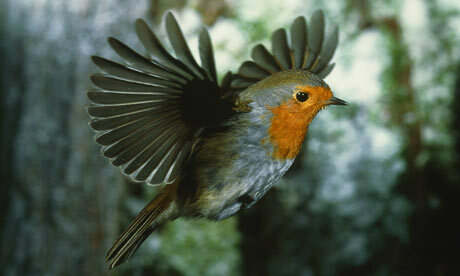 the thought of the thought of a robin in flight. In the act of imagining, of pure thought, the creation. A good place to leave you with today's offering: Gloria. So, my plan is to take you through the different choral parts of Mozart's C minor Mass, leaving out the Qui Tollis which I have already put up. It is what I sing on Tuesday nights, and will be until middle of April when we perform it in Edge village church. Normal service suspended as energies are otherwise engaged - creatively, it should be said, and I include Kindling sessions on the train and sunbeam dust-mote observation through wooden slats as well as the Writing and the Workshopping. Hwær cwom mearg? Hwær cwom mago? Hwær cwom maþþumgyfa?Hwær cwom symbla gesetu? Hwær sindon seledreamas? Where is the horse* gone? Where the rider? Where the giver of treasure?Where are the seats at the feast? Where are the revels in the hall? Where indeed? And where are the bloggers of yesteryear? You may well ask. For when I first began this game, the blogging I mean, there were many bloggeurs and bloggistes at work whose names I do not see now, or the blogs themselves are there, like monuments to "temps jadis." But the people who wrote the words? Ubi sunt? On the other hand the blogging itself, as a respectable activity, has now come of age. Everyone who is anyone is at it. Makes you think, doesn't it? Because erstwhile, when we, mes semblables, were young, it was generally sniffed at, not considered a proper pursuit at all for respectable, thinking, artistically-inclined peeps but now those very sniffers are not only blogging for their lives (and to promote their books, obviously) but twitteriing like demented birds, in a cacophony of tweets. Perhaps not blogging is the new blogging and people who don't do it will be considered a bit, you know. So in order to be cutting edge you have to not do it - but only if you have, already, if you get my drift. If you never did in the first place then you just have to find something else to not do. And here is the lovely George Brassens, singing about the Dames of Yesteryear. Wait for me George - I'm coming there too! They are back again. Sweet neighbour came and alerted us yesterday. Well, she has an interest because one of them grows near her garden. They smell of rotting corpses, you see - not that I have ever smelled one of those, but it is apparently an established fact that this is what they smell of and I can vouch that it is probably one of the worst smells ever. Flies love them, as you would expect. 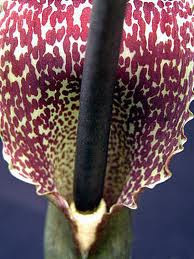 They are also known as Dracuncula Vulgaris - good name, lots of appropriate resonances. Let us fashion something flamboyant and horrible that stinketh to high heaven, saith god. And this year, let us put it right back in Signs's garden in the place from which it was painstakingly dug up last year, by the roots. Why have you done this, god? Because I can, s/he saith, can't you take a joke? So anyway, someone (not me) is going to have to dig them up again before they manifest their peculiar properties. Sorry god. It being Shrove Tuesday, one of Mr. Signs's favourite religious festivals, I have prepared batter, fabulously caramelised stewed plums, got the creme fraiche, maple syrup, lemons and caster sugar. It is all we are having for supper tonight before Mr. S watches the Arsenal match tonight and I go back to choir. I have added an extra egg - turns out better that way. Time to take stock again. This has been another difficult winter for me, for people with M.E. generally, here in Blighty, up against shabby untruth and those in positions of power who would, for diverse reasons, obscure the truth about M.E. So on we go, with scant resources, lucky if we have the love and understanding of family/close friends and/or the proper attention of someone in the medical profession. But everywhere, and always, people turn their faces away. Not that one holds one's incurable Condition in front of people. Mostly we are at (literal) pains to carry on with every bit of life in a way that doesn't refer to illness and disease. As a deer pants for the water (if you'll bear with the biblical resonances), so our souls long for the good life, meaning the everyday, precious, taken-for-granted, walking-on-the earth-and-doing-of-this-and-that life. But with the best will in the world, the most determined effort not to make people feel uncomfortable, the truth of the situation will manifest, and it is bad news. It is not good P.R. to admit or reveal the extent of it, the truth of how M.E. compromises a life, it frightens, angers, repels people. And 'compromises' is a nice, civilised word to put at the entrance of M.E. reality. But on the other hand, one does learn to accommodate - must, or go mad. So we do, in a sense, become very strong. John Falk has recently 'come out' about having M.E. There will be no rewards for doing this, as he undoubtedly knows. If he gets away without being openly maligned, cut off and discredited he will be lucky. I see that he too has done the round of useless (because they need educating) Shrinks: "I spend my money and more importantly my precious energy stores educating them on CFS while they in turn struggle to fit me into a paradigm of psychological dysfunction." I wish him well and hope that others speak out, stop being ashamed and own up to having M.E. Better for us all if the truth, the extent of it, comes out. But I also hope that not everyone with a fatigue-related condition jumps on the M.E. wagon and speaks, especially those who have been "cured" after a year or two and want to tell us Like It Is. I say "us", as though there is a comfortable base of 'usness' where we are together in mutually supportive harmony. There are all kinds of M.E. online support groups and many PWME who now blog about it. But the debates around M.E. make for a volatile scene and there are spats and fights, inevitably. And we are all, perforce, alone with it and the particularities and degrees of incapacity. For myself, I confess that I am ambivalent about the giving and receiving of "support". I do not even know that "support" is actually what I want. For M.E. to be recognised, believed and understood - yes; for there to be a ground of truth on which we can stand - yes; and for proper recognition and respect so that I no longer feel ashamed to say how things are - oh yes! And to this end I want to give a measure of energy. But I don't want to spend the little strength I have focussing on all the particulars of my or another's M.E. I can see that this might be good at certain times for certain people, but it is not good for me now, at this time. For now, I need to put my focus, if possible, elsewhere. Time does not only fly. It presses. There are things I still want to do, the limitations notwithstanding. And never mind the rest of my life, there are things I want to do in the next couple of months: writings, poetry readings, workshops, choral singing, trips to London to see the lovely, musical things my kids are putting on or appearing in. We will see what is possible. saying everything is groovy while your tyres are flat" - oh yeah!